Joyce K. Reynolds is an expert Business Coach who works with CEOs, senior executives, entrepreneurs, business owners and countless others providing knowledge, support, motivation and solutions that assist her clientele in successfully meeting significant workplace challenges. Ms. Reynolds’ work as a Coach started over two decades ago first as a corporate mentor, ultimately, over the past ten years, as long-term Coach to entire organizations. In her role as trusted adviser, Joyce K. Reynolds helps her clients recognize and use their current success as a basis for future growth. The focus is on identifying and developing effective methods of achieving change, redefinition and growth in organizations. The concept of taking personal responsibility is emphasized. 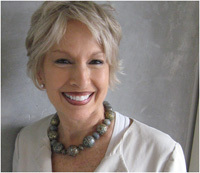 Ms. Reynolds’ successful, high-profile business background – including her former position as corporate Sr. VP/Mktg and NYC-based business owner – delivers to her clients the added benefits of broad workplace experience, profit-oriented marketing/creative expertise and highly developed strategic skills. Along with pertinent business experience and expertise, highly-developed communications, problem-solving and listening skills, keen intuitive awareness, Reynolds’ brings well-honed diplomatic talents. Her Bachelor’s Degree in Sociology from Indiana University and Jungian studies also lead to clear, healing direction in countless personal aspects of life. As a perpetual student of spiritual practices, she offers universal perspective and guidance in pursuit of higher understanding and enlightenment. Her professional voice training, background as a radio talk show host and well-honed listening skills and humorous outlook contribute comfort, openness, trust and balance during the Coaching session. Joyce K. Reynolds practice is devoted to encouraging solution-oriented, self-empowering, ethical behavior in the workplace. She provides useful insights on how to permanently enhance personal and organizational effectiveness, performance and growth in the workplace. *Exec. Producer – Retail Adv. Video Enterprises, Inc. (R.A.V.E.) N.Y., N.Y.
*Sr. V.P./Marketing – Siegal & Gale (a Saatchi affiliate) N.Y., N.Y.
*VP/Marketing – Payless ShoeSource (Volume Shoe Corp.) Topeka, Ks. *VP/Advertising – John Wanamaker Department Stores, Phila., Pa.
*VP/Account Supervisor, Kenrick Advertising, St. Louis, Mo.